I’m the daughter of a grain farmer. We grew wheat, oats, and barley on our family farm in Saskatchewan. Home-made bread was part of every meal growing up (lucky us). Mom could stretch the meal with bread and butter, and I know we weren’t alone. Sauces thickened with flour, baked goods welcomed us home from school, we started our mornings with porridge. All healthy, right? And I was a pretty healthy kid – energetic, bright and talkative. Rarely sick, I’d catch the junk going around at school – Chicken Pox, Stomach Flu, you name it. Flash forward 45 years – my weight started to creep up, I often had the sniffles and regularly succumbed to respiratory infections. My joints ached. Out of nowhere my elbows starting hurting. I became used to it. Flash forward to my 50s, I felt like I hit a wall. With my face. Weight loss was incremental and short-lived. My body ached for no reason whatsoever. I’d go through bursts of energy/feeling good, working out, eating “right,” including “heart-healthy” whole grains. Then I’d hit a point of complete and utter exhaustion. My Pharmacist suggested Thyroid medication and that’s helped – somewhat – but still — right before Christmas, I woke up one morning to muffin face. That tired-puffy-you look like h*ll moment. Worse yet, I felt it. Going up and down stairs became painful. My wrists started to ache. I was restless at night. I was running on empty. Like many of you I’ve counted points on Weight Watchers, I’ve choked down Nutrisystem, I’ve taken over-the-counter metabolism boosters, I’ve followed Atkins and here’s what happened: I was cranky, hungry and annoyed. I like to cook, I like real foods, and pre-packaged junk just isn’t my idea of a meal. So here’s what I did. I read and I read and I read and I read. I watched a PBS special featuring Cardiologist Dr. William Davis talk about what happens to your body when you remove all grains. I had purchased his book “Wheat Belly” 2 years ago and never read it. I read it. Then I bought “Wheat Belly Total Health,” and I read that, too. On December 20th I bought his newest book, “Wheat Belly 10-day grain detox.” I read that too, only this time with a highlighter. On January 3rd I took the picture on the left at 6pm at night. I started detox Jan 4th and the 2nd picture was taken yesterday morning. 10 days. I felt a difference in 3. My skin is happy and less inflamed. My face literally shrunk. I lost 5.5 lbs and more than an inch off my waist (!). My eyes are brighter. I sleep like a tree fell. Detox is hard – your body is so used to grains/carbs/sugar that it will fight you for what it wants. But after about 4 days I found I was longer a chip-aholic. I no longer planned my dinners around what I could snack on later. After 6 days I rarely felt hunger and my joints no longer ached. With Wheat Belly you eat real, delicious, yummy food. REAL – not out of a wrapper or box. I’ve made Fettucine Alfredo with spiraled Zuchini noodles instead of Pasta. I had given up eating that type of food because I always felt awful afterwards. LOW-fat is a no-no on this way of eating – healthy fats are in (olive oil, coconut oil, avocados). My first picture is me living on grilled chicken in a “healthy” whole wheat wrap, eating whole oats for breakfast and sipping a light beer at night. My second is me eating Salmon seared in coconut oil, sauteed vegetables and grain free cheesecake with a glass of wine! No, I am not kidding. The transformation I see is from existing to living! I share my muffin face with all of you — to encourage you. Maybe, like me, you’re sick and tired of being sick and tired. Maybe your weight is “stuck,” too. Maybe you want to try something for 10 days just to see if you can. You can. If I can do it, you can too. for more visit Dr. Davis’ website http://www.wheatbellyblog.com/ or you can find the official “Wheat Belly” site on Facebook — packed with information, tips and success stories. That’s great! 5.5 pounds in 10 days seems like a lot. Perhaps that’s because I’ve been accustomed to the “old” diets. Good luck! Wow! Not sure I could give up carbs. Sugar yes, carbs — not so sure. Getting rid of grain is not the same as giving up carbs. Veggies are carbs, and fruits are carbs. It i s a new mindset, but VERY doable! You are right. For some reason I always think of pizza and pasta when I think of carbs. This is interesting. I’ve had a lot of the same aches and pains–knees, elbows (what’s up with that?) and feel my face is puffy. Yet I cook what I thought was healthy. I’m curious–beside the difference in the picture which is obvious, how are your aches and pain? If you’re happy, I’m happy. 😀 Congrats on feeling and looking better. I quit cold turkey a year ago. Started by eliminating bread and potatoes. I am 81 years old and have lost 36 pounds, down to best adult weight ever. I too have done all the name brand “diets.” Wheat Belly is not a diet but a way of life. If you want to move stubborn pounds, just try giving up your fav grain foods whatever they are. They are keeping you fat. Calorie counting does not count with Wheat Belly. We get plenty to eat. We find new favs to snack on and plan meals around. My spouse is not doing the plan, but I have no trouble preparing meals. Our plates are the same except he gets a starch with his protein, and I have my protein with two helping of veggies and a bigger salad. He gets a sandwich for lunch. I enjoy a big mixed salad, including deli turkey, boiled eggs, tuna, or leftover meat or fish. With dressing in moderation. (BTW substituting like this works very well when you are eating out. No cheating, just subbing) I am never going back to the unhealthy eating habits I learned as a child. I have gained and lost hundreds of pounds since teenage. I snack on raw almonds, celery & hummus, raw vegetables, small servings of fruit, and string cheese. I like a glass of red wine once in awhile. The beauty part is you do not have to go around hungry on Wheat Belly. No calorie counting. No deprivation. Slim chance that I will ever regain the weight I lost. I tested pre-diabetic last year and that keeps me on the Plan to stay healthy. Looking forward to repeating the A1C test this year and will see if I have moved out of pre-diabetic range. Take the Challenge! Wheat Belly works! Thank you Dr. Davis!!!!! Jan I love that you weighed in with your experience — you are an inspiration! You are so right – you don’t have to starve (which triggers food obsession, in my opinion), you don’t count calories, and you are not deprived. I am learning new ways to cook – some attempts have been great and others not so much -but it’s been fun trying new things and revisiting foods I’d long since given up ever having. With my sister’s heart attack last year and really NO family history of cardiac disease – I am motivated to take better care of myself and FEEL 52 instead of 104. 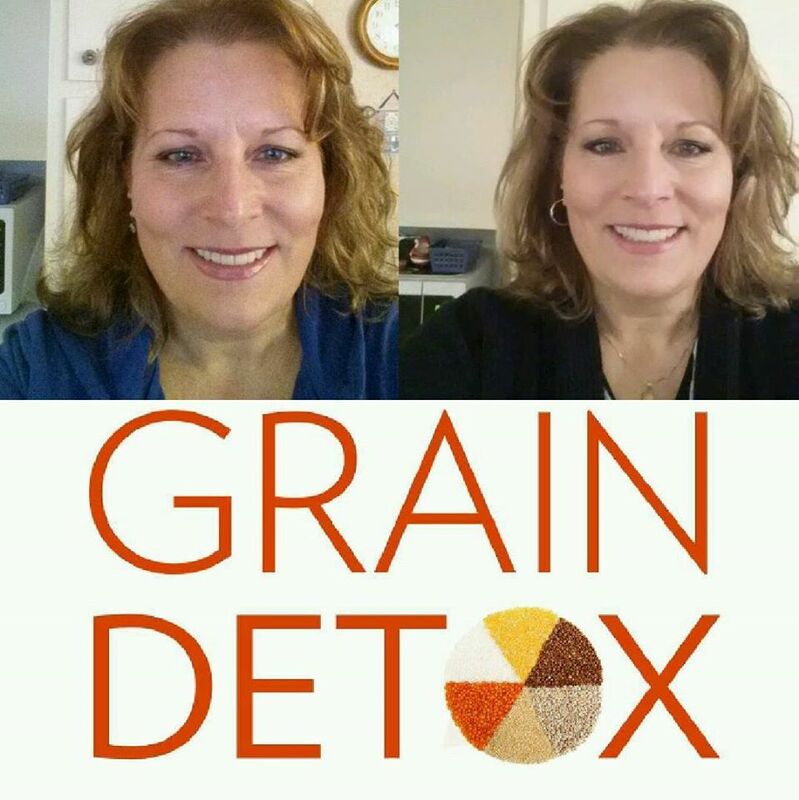 I have removed grains from my diet and l have lost weight and cured my excema. I have added probiotics through real sauerkraut and kefir milk. I have also added bone broth made using bones from non medicated beef and my arthritis is 75% improved. I eat organic and non GMO, as much as possible but for sure the Dirty Dozen. I can eat as much as I want and never gain weight. I salt my food and eat homemade baking using coconut flour and real chocolate chips. I use all natural skin care products no chemicals or GMO products. I am almost 60 and last month at the rink someone asked me what was my little boy’s name..my answer…”This is my grandson and his name is K_____.” The young man’s response, “You don’t look anything like my grandma!” I feel good and move freely and sleep better! The difference is amazing, MJ! Keep up the good work. MJ – You look beautiful! Congratulations on finding a workable solution and I’m gonna try it too! Thanks for sharing. Thank you Dor; I would give this advice – don’t rush in. Just my experience but there is quite a bit of info to absorb & some prep is needed. If you decide to do the detox, do it during a period of low stress when you’ll mostly be home/not traveling. I started on a Monday when I was in the office all week, but I cooked a lot on the Sunday first. I stopped and bought the prebiotics and other supplements ahead of time — then I just ripped the band-aid off and went for it. Detox can leave you feeling rough, I felt like I had the flu for about 6 days — achy muscles and tired beyond belief. That was confirmation that my body NEEDED to make a change. Once I broke through that plateau energy started to return and I could see a difference in my face in 6 days. I rarely am hungry now and I eat when I am – but this food is nourishing and satisfying. I don’t feel deprived. I don’t snack at night (and I was the phantom night snacker!!). Congratulations. My concern is getting my very stubborn hubby on a “not like your momma made” dinner plan. I run out of ideas just trying to make 6 or 7 dinners let alone 21 meals. I could live off of many of these things. Is your hubby doing the detox too or is it two types of meals? My hubbs lost his weight on the “1 plate” rule (self-imposed) and he also reduced his potato/bread intake some time ago. But – He is fine b/c I have always cooked a variety of foods so this is no different — for years I have cooked several meals on Sunday to carry us through the week. The difference now is I cook once more mid week -for me. Kind of a treat b/c I pick out what I want. The unexpected thing is youngest boy likes the food I’m making on this WOE so I include him, too. The satiety level of this food is high and the portions are large – I’m not making as much food as I thought I’d be b/c it goes a long way. Plus I freeze portions for myself to take for lunch – i.e. soup, pizza, lasagna etc — Today I am making spinach stuffed chicken breasts wrapped in bacon – yummo!! Do weightnot.com. Just don’t reintroduce grains or dark chocolate as they say to during the maintenance period (the rest of your life). Your enthusiasm has me ready to check this out! Coming from long and lean genetics, I’m fortunate not to struggle too much with my weight, but muffin face and that tired, listless feeling are all too familiar. And the idea that we don’t have to eat “rabbit food” might even sit well with my hubby. Thanks for sharing your experience, MJ! It wasn’t a huge change for me b/c I eat a lot of veggies already BUT the change was I was eating low fat or no fat – and GAINING weight!!! GAH! Hubbs is a meat/potato guy and that’s fine, it works for him and he’s healthy. I can’t eat like that without feeling like a tub of lard. So glad you’ve found out what works, MJ. Feeling and looking better–can’t beat those results! Hi there congrats you look great! I’m on my 8th day and it’s getting easier my cravings is chocolate. Are you still eating chocolate? Any suggestions with the sweets department? My goal is to become heartburn free. I have been suffering with GERD and a hiatal hernia for 20 plus years. At my wits end. I’ absorbing every word of the blog and the comments as the doctor says I should go lactose free, gluten free and sugar free for a multitude of issues. My daughter has celiac and has been gluten free for several years since her diagnosis. I’ve done it off and on in support of her but now it’s about IBS, lactose intolerance, plus over the top triglycerides and cholesterol levels. I can’t tolerate statins due to aching legs as a side effect. Pre-diabetes is also an issue. So, thanks for the inspiration to get back off the bread wagon and crank up my alternative meals. Wish me luck. The muffin face is what convinced me. I don’t know that round faced woman who greets me in the mirror each morning.